For those of us (of all ages) who grew up with Star Wars, May the Fourth (sounds like “may the force”) has become the unofficial holiday of all things Star Wars. A large part of my continued loyalty and fascination with the Star Wars universe is due in large part to the relationships I have developed with the characters over the years. When the novelty of Light Sabers, X-Wing Fighters and Star Destroyers has worn off, I still find myself caring about what happens to my favorite characters. As an instructor and explorer of human behavior, I can’t help but notice that even in a galaxy far, far away… personality plays a significant role in the way these characters communicate and interact with each other. Bold, daring and not afraid to take risks, Han Solo holds the record for completing the Kessel run in under five parsecs! Han’s willingness to take risks has made him legendary, but has also landed him in hot water with Jabba the Hut. Han (like many D’s) isn’t into long conversations. In fact, it’s not uncommon for negotiations to end abruptly due to blaster fire! Loyal, faithful, hard-working and brave…Inside that huge, furry exterior beats the heart of a true friend. Although he doesn’t say much, Chewbacca can say volumes with a single “roar?”, but you have to know him. Like many S’s, Chewbacca is quick to jump to the aid of those he considers a friend. Nothing in the universe (not even a Death Star) can keep Chewbacca from coming to the aid of those he cares about. 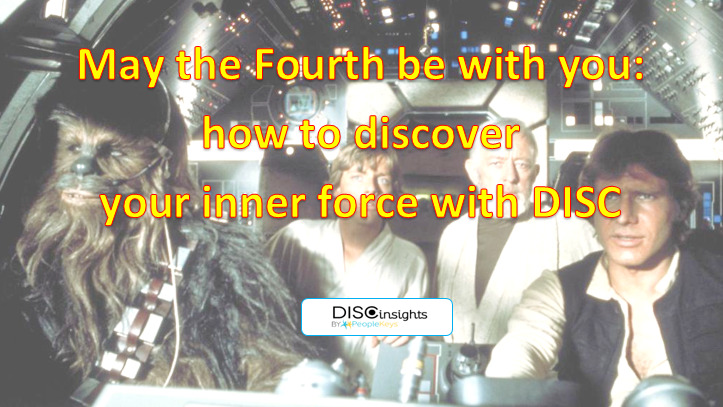 Just like young Luke uses The Force as a tool to reveal his potential, we utilize DISC Theory. The PeopleKeys DISC system for behavioral analysis is used worldwide to unlock human potential in areas of talent management and predictive hiring, business coaching, strategic sales and business planning, educational soft-skills training, as well as personal growth and communication development. Discover your inner force! Take the DISC Personality Assessment today.